Communication has been a fascination for man since the dawn of time. From simple methods such as cave-painting, body language, carvings or signage to more complicated means like binary, symbolism or sign language there are an abundance of ways for us to express ourselves and leave our mark for others and future generations. The evolution of language has brought with it a need to understand how we can effectively learn these skills and it is widely agreed that to be an effective language learner; that is to learn to speak, read and write, you simply need to go back to basics and use phonics. After much research and deliberation we concluded that the best system for us to use at Britannia School is the world wide recognised British Jolly Phonics programme. Not only does it have bold and colourful resources and exciting characters to capture the imagination of younger pupils, but the easy-to-learn songs and simple methods will allow us to make the English language accessible to all of our students, regardless of their mother tongue. Today, our teachers attended training on how to implement it effectively within our setting. Our trainer was a bubbly lady named Lana who lives and teaches in England, and carries out JP training all over the world. 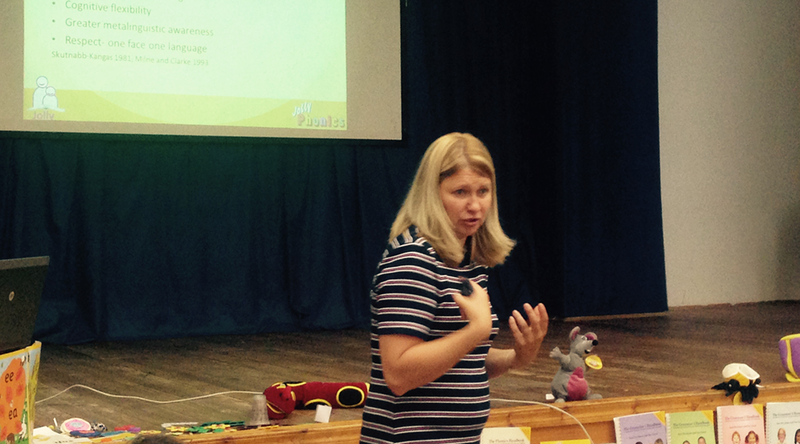 She guided us through many interactive games, and as a native Russian speaker she gave us plenty of tips on how to teach some of the trickier sounds to pupils who do not have English as a first language. 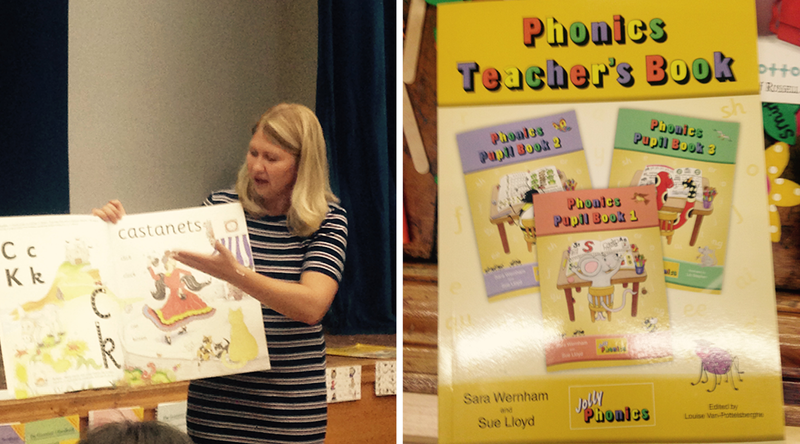 The Jolly Phonics programme identifies 42 different phonetic sounds present in the English language. Our students will learn to hear, say and recognise sounds allowing them to segment and blend a great number of words independently. Each sound has an accompanying action and song, making the lessons engaging for all types of learners. An example of this can be seen in the story book for the letter sound ‘s’ where a boy named Sam finds a snake hissing in the grass. Not only can you clearly see all of the ‘sssss’ sounds the story exposes for listeners, but children are encouraged to be vocal and hiss along with the teacher and move their arms back a forth like a wriggling snake to add a kinaesthetic dimension too. 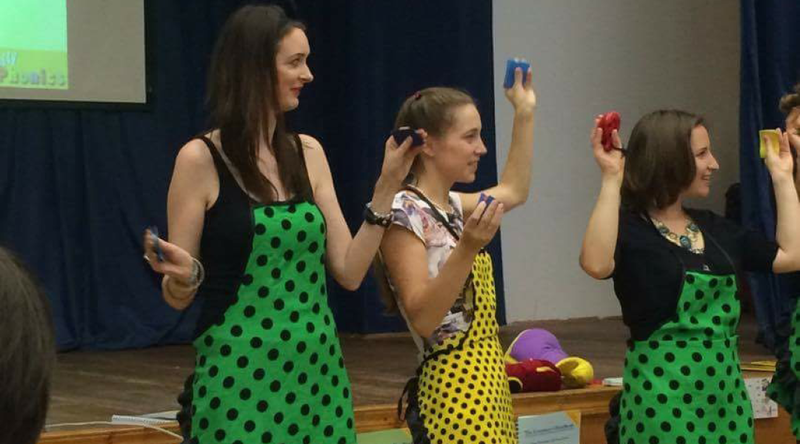 It’s easy to imagine how fun and interactive lessons naturally develop around the stories associated with each sound. 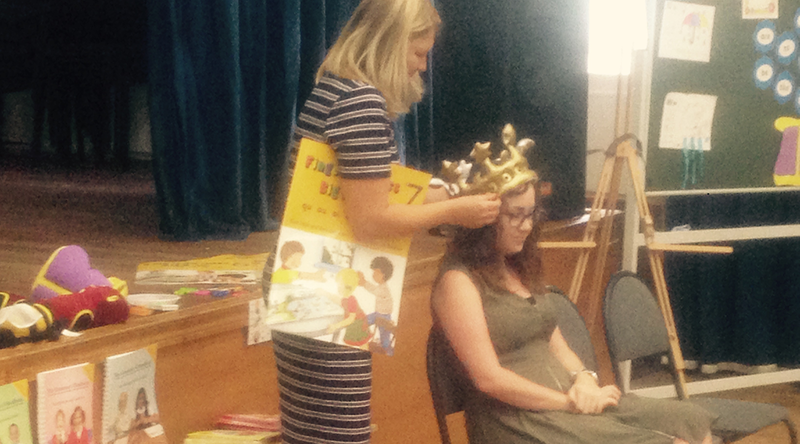 During the training day we were treated to some imaginative examples of this, our Nursery teacher Miss Kelly became the Queen of England and sat on a throne in front of the rest of the class. The tutor asked her “who would you like to choose to complete your tasks?” with which she replied “ue, ue, ue” (you) whilst pointing royally at the audience before her. This type of activity helps children to remember how the sound ‘ue’ should be made. The sounds modelled by teachers are ‘pure sounds’ and are often exaggerated so the children can not only hear, but also see how the movements of the mouth make the sounds. 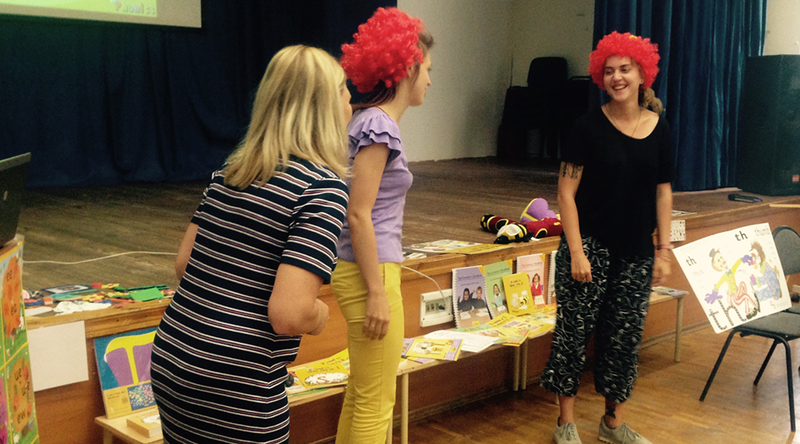 Our nursery assistant teacher Mrs Sokolovskaya was also brought to centre stage as a cheeky clown in an activity that focused on making the sound ‘th’. This sound is known as a ‘tricky sound’ as not only does it have two varieties, it also does not exist in some languages — it was clear however that through this funny and interactive lesson it wouldn’t take long for children to add it to their repertoire of sounds they can confidently say and recognise. 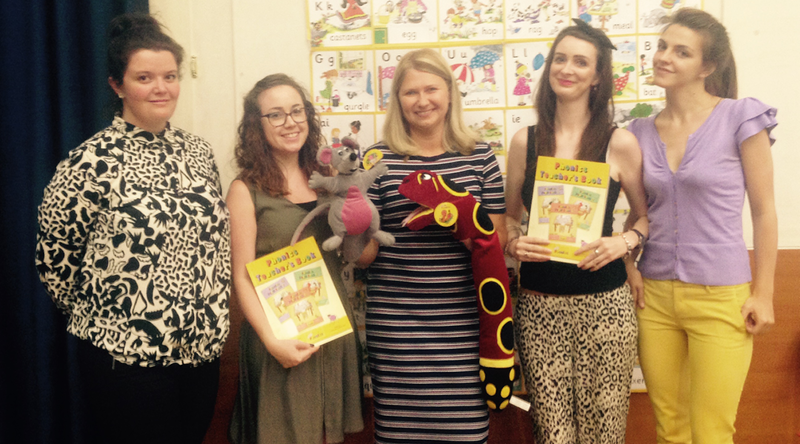 The Jolly Phonics literacy programme works well alongside the EYFS curriculum because both approaches encourage holistic teaching. Through Jolly Phonics, literacy is taught in such a way that all learners are catered for and each child will be able to learn something new irrespective of their level. Sounds, vocabulary, speaking, fine-motor-skills, story structure, confidence, reading, writing, questioning skills and much more are taught simultaneously in short, fun-filled lessons which the children will love and enjoy. Come visit our school to see the Jolly Phonics programme in action. Check out the gallery below for more images of this activity.